Mike McDonagh came joint second at the Wrexham Rapidplay. He conceded just two draws in reaching 4/5 without getting a chance to play the winner. Jixin and Jack Yang shared the slow starter prize. 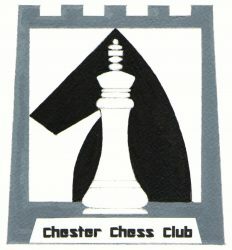 Mike nearly added the Chester and District League Championship the following weekend. Unleashing his inner Magnus Carlsen all he needed to do was beat reigning champion Colm Buckley in a microscopically better R+N ending in the final round. Meanwhile on the top board David Jameson and Phil Crocker had already unleashed their inner Carlsens by contriving a move repetition a few moves out of the opening, confident of their chances in the blitz playoff. Ultimately Mike only managed a draw and, perhaps tired from these exertions, blundered into a mate in the final blitz match against your reporter.